Let’s face it, no one comes to Barcelona looking for a good curry. However, if you are like me and you love some spice in your life, then I have a place to tell you about. On a regular basis, I have the need to eat the type of hot food the Mediterranean diet just does not cater for, so I feel lucky I came across Nice Spice. The menu offers a good range of Indian dishes including favourites like Chicken Jalfrezi, Lamb Vindaloo Peshwari Nan and other mouth-watering dishes always made on the spot and with good ingredients. I often bump into the cook when I go food shopping! As they invariably cater to the Spanish palate, if you like your food hot, simply mention to the waiter that you mean business and the kitchen will push up the dial on the spice front for you. The venue is cosy but not cramped and they have a few tables outside for when the weather is good. 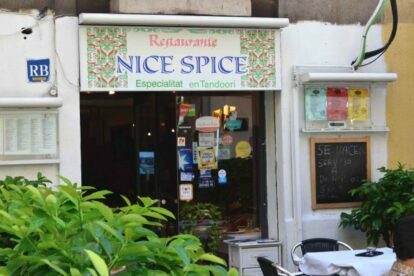 Nice Spice also delivers so you can indulge in that so-British institution of the Indian take-away. Personally I prefer eating there, while I watch Indian music videos (with the sound off) on their giant TV as my mouth burns with delight and I quench it with a cool mango lassi.